Merino wool is the #1 choice for base layers, because the technical properties of merino wool make it incredibly high performing in a wide variety of conditions. The base layer sits next to your skin, so you need a fabric that will keep you warm in cold conditions, lets your skin breath but also doesn’t make you overheat. Merino wool meet these requirements, but it also gives you other extras. For example, you’ll find that merino doesn’t start to smell after repeated use, thanks to its antibacterial properties. 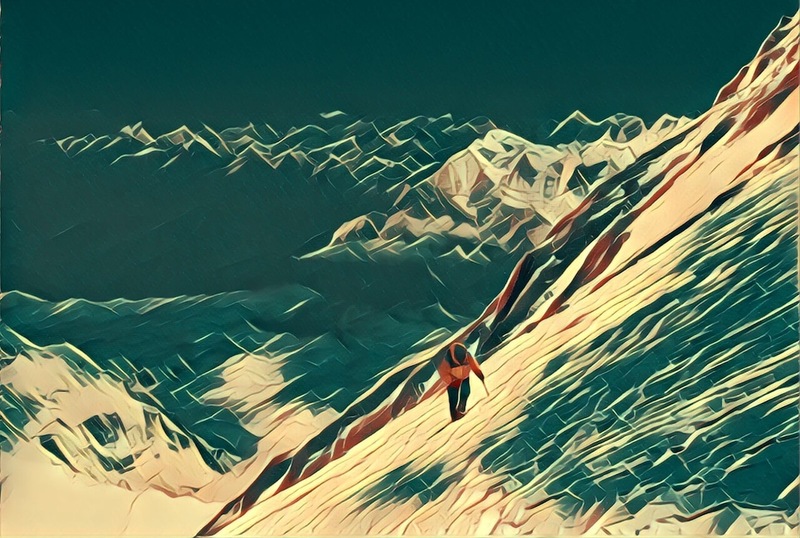 It’s for this reason that professional skiers, mountaineers swear by merino wool as a base layer. In a hurry? 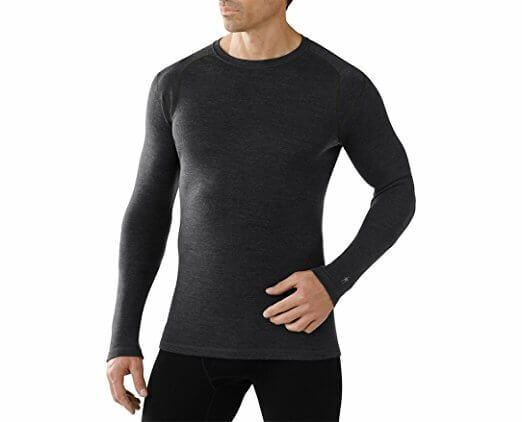 Below, I put the top three picks for men’s merino wool base layers for tops and for bottoms based on my 5+ years of fanatical merino wool research and personal experience. Otherwise, you’ll find an in-depth guide to men’s merino wool base layers below the tables. 100% merino wool at 200 g/m for 3-season wear. A fairly tight fit, which will insulate you well in cold weather with crew neck, flat-lock style seams for less irritation and drop-tail hem, so it doesn’t ride up on your back while backpacking. 100% merino wool at 250 g/m for cold weather wear. SmartWool’s tightest fit with flat-lock seam construction, crew neck, shoulder panels to avoid shoulder-top seams. 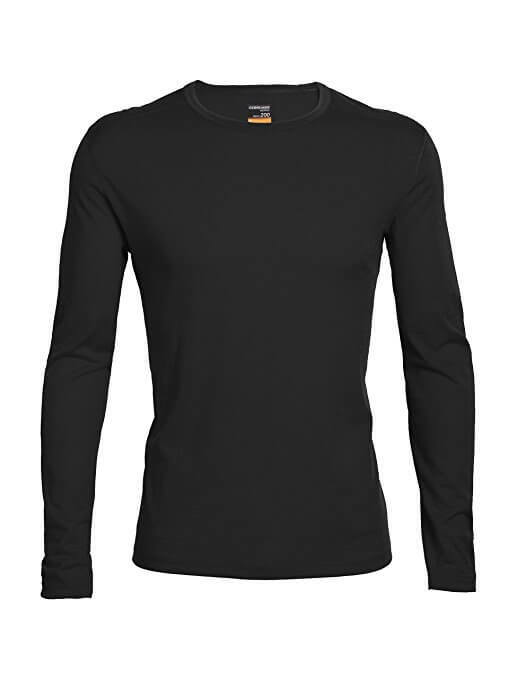 Best for cold weather, as it’s the heaviest base layer on the list. Blend of merino wool and polyester, at 160 g/m for warmer conditions. A moderately tight fit with a drop-tail to keep your back covered, zipper is covered on the skin side for comfort and raglan sleeves for better range of motion. Best for spring, summer and fall, as it is it’s incredibly light. It will dry quickly thanks to the blended material. 100% merino wool weighing in at 200 g/m. At 200 g/m, it’s perfect for mild winter conditions as well as fall and spring hiking as well as hiking in cooler summer regions. 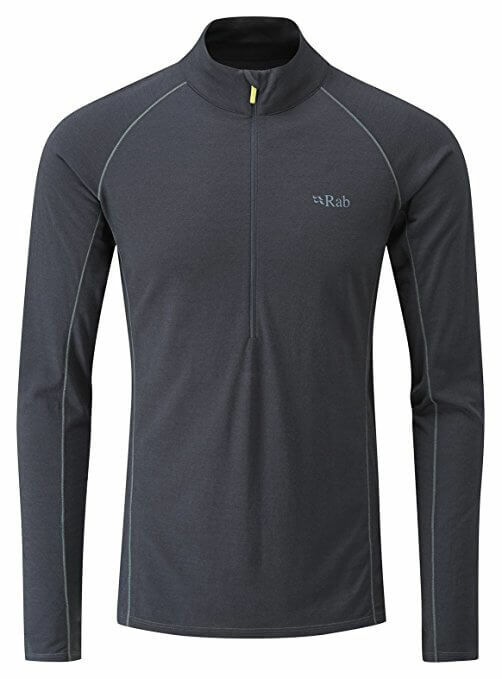 At 250 g/m, this is SmartWool’s warmest baselayer for the coldest conditions. At 170 g/m, these are the lightest leggings, so they are great for everyday wear. *The Minus33 leggings are also available in mid-weight 230 g/m2 and a heavy weight 400 g for seriously cold conditions! You’ll also find recommendations for merino wool underwear for men as well as merino wool underwear for women. Why is a Base Layer Important? A base layer is the layer of clothing that sits next to your skin. A good base layer will wick sweat away from your body, keeping your dry, comfortable and warm. Thermal base layers, including merino wool, insulate your body by creating a layer of air around your body. This can keep your warm in cold conditions, but it can also cool you down in warmer weather. Because your base layer is next to your skin, you’ll want to make sure that the material is as comfortable as possible to avoid chaffing or irritation. You should look out for ultra-fine merino wool (17.5 microns or less) in any merino wool base layers so it won’t be itchy. The idea of layers is that you wear multiple layers instead of one big bulky one. This lets you have a base layer that keeps you dry via wicking, a mid layer that provides warmth and an outer layer for protection against wind and rain. It also means you can easily adjust your clothing to suit conditions. You can take off the outer layer if you don’t need it. For example, when you’re back in the ski lodge after a day’s skiing, you can strip down to your base layer. Why Can’t I Just Use Cotton? Cotton retains moisture such as sweat or rin, which means that they won’t keep you dry and therefore warm. Wet skin loses heat much faster (25x faster according to the United States Search and Rescue Task Force) than dry skin, so that’s why keeping dry is so important. In backpacking and adventure circles, it is for this reason that you’ll hear the saying ‘cotton kills’. Put simply, if you’re looking for high performance material, cotton will take last place on the list. Why is Merino Wool so good as a Base Layer? First off, modern merino wool fabrics are incredibly soft and comfortable, so they feel great on your skin as a base layer. Unlike other types of wool, they don’t itch, especially if you look out for a low micron count provided by most premium Merino wool manufacturers. Secondly, they regulate your temperature, as wool creates tiny pockets of air around your body.